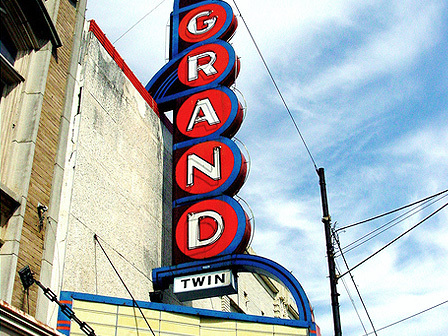 Constructed in 1937, the Grand was the largest theater in Paris for over fifty years, and its fly-loft was the tallest west of the Mississippi. In 1996 a new theater was constructed. The already deteriorating Grand closed and later, the property owners abandoned the building. Roof-top openings allowed water to seep in causing water damage and pigeon infestation; peeling paint and crumbling ceiling tiles make the building a health hazard. There is flooding in the basement and a crack along the outside of the north wall. But the people of Paris know that with the rebirth of the downtown, the Grand Theater can again become the beautiful building it was designed to be by architect Jake Elder, designer of the Interstate Theater chain. The important historic buildings of downtown Paris will be further enhanced by the rehabilitation of the Grand Theater.